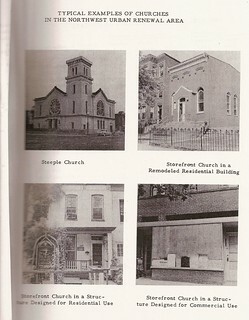 There are dozens of churches that existed in general Shaw area in the 1950s that are no longer around. Some church congregations moved, some churches are closed by their denomination, there are a variety of reasons. The Lincoln Memorial Congregational Temple at 11th and R St NW, 2-3 blocks from the Shaw metro R Street exit had its last service this weekend. The Washington Post made mention of gentrification in its article about the church’s last days. There isn’t a direct blaming of gentrification, but there is a lot of hinting. The church attempted to reach out to neighbors, added some programing but couldn’t get the membership numbers up after the Rev. Benjamin E. Lewis retired. Yes, parking pressures didn’t help. 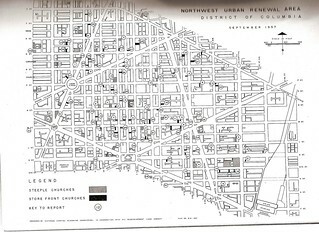 But looking back at the 1957 Church Survey (PDF), Lincoln UCC church members mostly lived outside of the Shaw neighborhood. The Church Survey from October 1957 looked at steeple, storefront and residential houses of worship from a block over from U St, Florida Ave, 14th St NW, Mass Ave and 2nd St NE. Lincoln UCC was one and in 1957, 74% of parishioners lived outside of the map in Brookland and Kenilworth. Those 25% who did live in the Northwest Urban Renewal Area were reported to be elderly members, who should be more than dead right now. Don’t blame the demographic changes on the church’s decline. When doing neighborhood history, I encounter many quaint fictions. Most of them are harmless. There is the belief that residents are home owners. And there’s the idea that church congregants lived in walking distance. Some do, many don’t. Bible Way Church, which stopped the I-395 from destroying Shaw and going all the way through, only had 30% of its members in the Urban Renewal area. Mt. Sinai who will host tonight’s BACA meeting, had 96% of its members scattered elsewhere in the city. 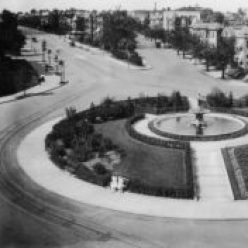 The upper and middle class Blacks who supported and were a part of these churches did not all live in the slum that was Shaw.